The prevalence of illness and premature death due to lack of awareness, access to good medical care or failure to take advantages of care mental or psycho-social disorder have long made medical care a topic of prime concern to the field of medical social work. We have come to realize that success of medical care or treatment is based as much on the adequacy of the delivery system as it is on the knowledge and skill of the medical personnel and social worker. Medical care is an important field of practice for social workers who play significant roles in facilitating the delivery in social services at the individual groups and community. (1) Medical social work is a professional and specialized branch of social wok. 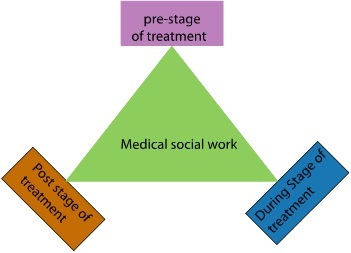 (2) Here the social work method, skill, philosophy is being used for the treatment of a patient. (3) Medical social work emphasize not only for treatment but also it attempts to provides training and rehabilitation facilities. (4) In medical social work social case work and group therapy are used properly. (6) Medical social work is a integrated attempts of spiritual therapy, psycho-social, religious and educational therapy. (7) Here poor patient get help and guideline to adjust with the hospital environment. (8) After all medical social work provides counseling follow up, treatment, home visit, psycho-social therapy with applying the social work method principle and code of ethics of social work discipline. Medical social work is a social work practiced in a responsible relationship to medicine and public health within the structure of program of health and medicine. Social catastrophes- poverty, sickness, suffering and social disorganization psycho-social disorder have existed through out human history.Until the nineteenth century, ancient social institutions such as the family the church and the community were able to deal with all but the most overwhelming social problems. But as societies became industrialized these institutions becomes increasingly inadequate to handle, the many new social disorder created by population movements and technological changes. A more formal system of social service was needed. For this reason social welfare was emerged to provide proper social service. Medical social work is a branch of professional social work. More over the evolution of medical social work started its journey with its mother social work. The historical development of medical social work 4(four) special events was played strong role to the come forth in the present status in developing pattern of medical social work. First: the competent authority of England has been reorganized ‘after care’ to prevent psychiatric patients from illness. 2nd: association of ‘Lady Almoners’ by the ex students of London English hospital by the inspiration. 3rd: the working experience of visiting nurse. Lillianwald and Merry Brewester of New York Henry Street, Settlement house in 1893 has been visited the houses of poor patients from that time the hospital authority has started to send the nurse to the patients house. 4th: The 4th step of medical social work is to send the medical students to social agency. Dr. Charles P. Emerson has taken initiatives to prevent social and emotion problem as a part of medical education. 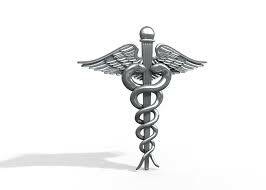 Based on the above experience, medical social work was started its arena in 1905. In this time, social workers have been recruited in Massachuates , New York , Boston , John Hop Kins hospital. At first Dr. Richard C.Cabbot of Massachuates GeneralHospital in Boston has recognized formally importance of social workers in medical social work. Now medical social work is providing crutial and essential service like medical service. Although hospital social work runs its activity with the cooperation of hospital authority. Bangladesh is a most densed populated and problematic developing or least developing country in the world. The magnitude of social problems in our present society make it necessary to organize under public and private initiative social services for peoples in need. Our country suffer most in medical and psycho-social disorder. To realize the sense medical social work started his journey in the decade of 1960s. It is started with the help of United Nations and International Red cross in 1954 at DhakaMedicalCollege. 2(two) social workers was recruited by the National Council of Social Welfare Paridapur* in 1961 4(four) social workers was recruited in Citation, Rajshahi, MidfordMedicalCollegeHospital and ShowrawardiHospital. For its importance in 1995 another 15 (fifteen) Hospital Social Work Department has started. This project is expanded and recruited 385 Social Worker another 11 (eleven) hospital in 1997. Another 33 (thirty three) unit in 33 district, 1 (one) in Central Drug addiction TreatmentCenter, 1 at Dhaka city and rest 2 (two) at Khulna city has been set up. At present under the Social Service Department, there are 84 (Eighty four) hospital social work running on and total 98 officers and 176 employees engaged there. Day by day the accessibility of medical soical work is being increaed potentialy. The main goal of MSW in Bangladesh is to provide proper services for the patient, basically for the vulnarable patient with co-operation with the NGO or the donation of philanthropist or warm hearted people. Deputy Director (Treatment & Probation) of social services department Momotaz Begum, said that to emphasize psychological affairs for ensuring the full treatment of the patients. To build up Report and collect social-economic and related information to assist the doctors to full cur the patients. To identity the poor and vulnerable patients from outdoor and includes them within the medical social service. To send the identified patients to the related department and doctor. To admit the patients in the hospital by the basis of prescription of the doctors and assist in treatment process. To build up relationship between the patient and doctor. To assist poor patients by giving them medical, blood, artificial parts of the body, spectacles, and crèche etc. To assist mental disorder type of patients using psycho therapy. To keep the long periodical indoor patients from anxiety with proper communication with his/her family. To motivate the patients for operation. To counsel the illiterate patients for family planning, maternal and child health care and the way to prevent the transmitted diseases. To send the patients to the home with financial help. To rehabilitate the poor patients within social service department under the poverty alleviation program. To follow-up the treatment and rehabilitation process of the patients. c. Role of post treatment stage. Admitting the patients in hospital: Many people don’t know the procedure of admitting in hospital, somebody even doesn’t know where he should admit. Social Worker helps them to admit in the necessary hospital. Help to adjust hospital environment: When a patient comes to a hospital. He faces some problems to adjust with the hospital and medical social worker helps him/her to adjust with the new environment. Helps to diagnosis the patient’s problems: Unlike physical problem a patient may social other problem (Mental, economic and family) which delays or inhabits his/her treatment. Medical social workers uncover these problems and their relation with physical problems. Help to ensure patients participation in treatment process: Sometimes it’s happen that a patient cannot participate totally in the treatment procedure. It happens because of ignorance, superstition and other factors. Medical social worker removes these problems and ensures patients participation. Materialistic help: To ensure patients treatment medical social worker provides medicine. Case study In the function of medical social worker, case study is being treated as a vital job. Because by taking case history a social worker can provide proper care and treatment for his client. Home visit: Home visit represents a upgrade method of medical social work. So very much consiously medical social worker maintain the home visit application and process. 7) Lack of efficient medical social worker. 8) Dual administrative tangle of medical social service. 9) Unawareness about the role of medical social worker. 10) To pressurize the medical social workers to do some less important task like communications, sending the patients, giving the information to the patient’s family. 11) Lack of after care treatment. f) To provide more funding for health sector. Finally ministry of social welfare, civil society, pioneer social worker and all works of life should come for updating the health services and medical social work. Considering drug abuse and addiction a big problem, so many government and non-government organisations including media are working hard on this serious issue for a long time. Drug addiction is not a newer concept. It represents a old history like human civilization. Normally we can say drug addiction refers a mental and physical dependency on drugs. For better understanding about drug addiction we should have a ideal idea about drug and addiction. .In addition I have to explain my use of the word “drugs”. While in english the word “drug” is used to denote substances that are being used as medicines, we use this word in dutch virtually only in the sense of illegal luxuries, varying from heroin to Cannabis, although the insight is increasing that alcohol and nicotine as well as coffee are drugs as well, if only legal. as they are used as luxuries instead of medicines. This results in remarkable semantics: morphine prescribed by a doctor is ‘medicijn’, (dutch for medicine), while the same substance obtained from a dealer is a drug. You will observe that in the following we use the word drug as both medicine and the element of addiction. To answer the question “what is addiction?” we have first to look at the apparition of the notion of addiction in the past. This will show that addiction is a fairly recent connotation, although the use of especially alcohol and opium have a long history as the element of addiction in the world. Hence addiction refers a dependency on any things but now this time addiction idicates the drug dependency. Finally drug addiction refers a psychological, physical dependency on a chemical which associated with several structural and psychological changes in the defferent part of the brain, spacially in the area of known. As the reward center. The uses of drug are an old history. The uses of drug were started at Genesis of the civilization with agriculture. The cultivation of cannabis was started at north Madaripur in Nogaon district (weekend magazine 13 October 1988) in 1805 maternal who is scientist-invented morphine. Buyer company of Germany invented heroin in 1898 A.D.L.S.D. and pathedrine were invented respectively 1908 and 1940 A. D. Actually these drug materials are invented for the welfare of men at the sphere of treatment. Subsequently man started abuse of this drug. As a result it creates many kinds of problem in the society. Drug addiction is complex and old social disease of human civilization. There is a deep relation with evolution of science and art of curing diseases. What things we call drug. It was called phamacon means poison and medicine. Opium was used as valuable and active medicine at the sphere of medical in 2nd A.D. From the ancient crag the salient thought opium was used as hilarity in Sumerian civilization about six thousand years ago. The English banyan introduced drug first in China. It also introduced in our country under supervision of British banyan In order to succeed at politics and economics. The European country with Britain inspires the public to cultivate drug. Opium was started to use at the sphere of medical and enjoyment in European country. Wine and ganja has been using in this country for many years ago at special function. Heroine was brought 1983 A.D. There are about 12 lakh addicted people in Bangladesh about six lakhs addicts live in Dhaka city. From the last few decades most countries in the world had been in the grip of the epidemic of addiction. It is widely believed that trade in illicit drugs is the largest business in the world and so, the supply of drugs is not going to dry up for the epidemic to get over. What is required for the demand to be reduced or for the addict to become and stay de-addicted? Unfortunately, very few know and understand the meaning and implications of addiction and so it remains one o3.1 Drug addi f the most poorly treated diseases in the world. Drug addiction is a silent slayer. Drug materials are those materials, which grow addiction after taking it. It is a bad habit of taking drug. As a result of taking drug materials the health of drug addicts are marred. The life strength is decreased. Drug materials are available in our country. For this reason the number of drug addicts is increasing. They gradually become dependent on these materials are called drug addiction. Bangladesh is transit of drug Mafia, Efforts to hide the smuggling of 68 Kg heroin. Rootless movement of Joint Force, drug smuggling materials has been hidden by pre-information. Another deadly addiction has been replaced as phensidyle. Another deadly addiction is yaaba tablet coming within the border of Teknaf, Bangladesh will face as a result of Thailand. For drug poppy cultivation is running and by refining morphine, codine, heroin. Yearly total expenditure of drug in Bangladesh is Tk 8,000.00 million and for average for drug abusers are Tk 4,500.00. Drug abuse and addiction have become an alarming phenomenon in Bangladesh dangerous. Of course, large number of drug addicts in Bangladesh is a serious national concern. According to unofficial estimates, there are 2.5 million drug addicts in the country. An ever growing menace of drug addiction is affecting not only the younger generation, but also the society as a whole. It is no exaggeration that a huge number of students of Dhaka University are becoming hooked-up into drug day by day as none is taking any action in the border areas against illicit drug trafficking. Different kinds of drugs are selling at various parts of the Dhaka city including Kamrangirchar, Begunbari slum, Bhanga Gate, Shahinbagh, Nakhalpara, Titipara slum, Sutrapur, Dholpur, Demra, Tejkunipara, Chankharpol, Tilpapara in Khilgaon, Modongoli in Sipahibagh, Mirpur section 1, Agargaon, Adabar and Geneva. There are many reasons to get involved with drugs, but easy availability is the main cause for becoming drug addicts. All types of drugs are available in different places near Dhaka University campus. Drug dealers have developed a strong network on the campus. Some small stalls of different halls are selling drugs almost in broad day light. At night, some tea and cigarette sellers use to carry drugs to residents hall. The guards and the security personals are helpless because they are threatened to keep quiet. Some of them are directly involved with the selling process. This situation is deteriorating due to administrative inaction. Dhaka University campus is surrounded by densely populated area and small markets including Chankhapol, Shahbagh, Bakshibazar, Nilkhet and Newmarket South Gate, Kantaban, Hatirpul, Palashi and Sarwardi Park. Gau-Sul Azam market of Nilkhet corner, small tea stalls of Shabag corner, cigarette shops and even small restaurants of Chankhar pol and Swarardi park are some of the ideal places of drug trafficking. Ganja (Marijuana), Puria (Heroin), Da-ill (Phyncidile) and Pathedine injection are found everywhere on the campus or those areas. They usually start with Marijuana and Phyncidile and then take all kinds of drugs, including heroin. A drug addict spends from Tk. 1,200 to Tk. 12,000 on drugs a month. Extortion, snatching money from pedestrians or asking from parents by saying that they need more money to maintain their rising educational expenses are some ways students basically use to arrange money to buy drugs. Unemployment, family feud, parents’ unruly behaviours, degradation of moral values and lack of healthy entertainment are the main reasons behind the drug addiction of the students. The government should take measures to stop drug trafficking. The present study was designed to assess the socio economic status of the drug abusers on the basis of information collected from individuals seeking treatment voluntarily for their addiction problem. 458 treatment seekers were interviewed mainly at CentralDrugAddictionCureHospital. Mostly abused drugs among the cases where heroine, phensidyle, tidiqesic, marijuana, pathedine, alcohol, and the other drug abusers showed that 62.66% were between 21 and 30 years of age and nearly 50% started their abuse behavior between 16 and 20 years. About 50% of the sample reported of a drug use habit for 1-3 years before seeking treatment. The rest 50% continued for up-to 10 years no significant difference was found when birth order was considered. Now days the teenager and youths are use Sleeping pills as a drug. Sleeping pills are randomly being used since they can be easily bought from any nearby medicine shop/pharmacy and in most cases without doctor’s prescription. These are: Enoctine, Seduxene, Phenergan, Stemetil, Laxatine. conditio. n and consciences of the abuser and also creates physical and mental dependency. A Cannabis abuser is seen weak, depressed or something garrulous. Sometimes he is frightened and feels amnesia. His sense about time and place and feeling power are also decreased. Moreover, indiscipline walking, quick heart bit, blood pressure, red eye and reluctance to food etc symptoms are also seen. A Cannabis user’s normal livelihood is drastically disrupted. Wine is a common alcoholic beverage. It badly affects on human organes like stomach, kidney,brain, heart etc. It is proved in laboratory that most of the liver sirosis caused by the wine. Heroin is a serious drug which is produced from Opium. In market it’s supplying in brown or white color powder. It’s totally an illegal substance. If any one is capsized with more than 25 gm or more amount of it, his highest punishment is death penalty. In Bangladesh brown color heroin is illegally trafficked. It’s using as Chasing the Dragon method with smoking in our society. Codin: It’s a by-product of Opium. It is normally used as a pain killing and cough prevention drug. In market it is supplied as tablet, capsule, solution. Here to mention that codin is used as main element of phencydil. Phencydil: It’s a cough prevention medicine which contains codin phosphate originated from Opium. Though it is illegal in Bangladesh; but it comes in Bangladesh through Golden Crescent route. Its looks like syrup and smell very acute. It creates feelings like heroin. When heroin is unavailable and costly, heroin abusers take phencydil as an alternative drug. It’s a medicinal drug generally used as pain killer injection. Pathedin creates very acute addiction which is tough to avoid if one become addicted towards it. Normally abusers take this injection by using one syringe. Thus they are under threat of Hepatitis B/C, HIV/AIDS etc. Morphine is produced from opium and used as pain killer but can create acute addiction for the drug addictaed people. To remove strain, tension or mental disturbance tranquilizer is used. Its abuse can reduce the functional ability of brain. In market it is supplied as tablet or capsule. Some recognized tranquilizer is Diagipum, Clobazum, Clonanipum etc. It is not possible to indicate one cause for addiction. According to I.P.G.M. “on post liberation social unheard, change of value system, personal and community frustration change of all seem to quitting as personal and social strain which are alleged to band to the development of habit of drag abuse depending on ones a person and social capability. Familial cause: many people become addicted living out of familial control or separation from family. a) The age group between 11 and 15 and young people become addicted for want of familial and affection and they started to do crime. b) If the familial conflict and divorce etc may goes on continuously, the children will become addict. Anxiety and excitement: many people become addicted because of anxiety and excitement. Many people are not evaluated though they hard for forgetting grief they take drug. Available of drug materials: drug materials are available in our country because of geographical condition. As a result people are being addicted. Depreciation of values: If men’s self esteem and depreciation of values happen, they will lead their life relentlessly and become addicted. Effect of friend: many people become addicted going to test prohibited things with to the help of friends. Most of addicted people cited that they had become addicted with help of friends. Slum is the home of drug and drug addiction.Personally i observed the same in the slum like Tejgaon slum. Collect money by criminal activities like hijacking, extortion, etc. Drug addiction, a decaying menace, is not only injurious to an individual but also imperils thehealth of the entire social fabric with fast cascading impact. Drug abuse and addiction have become an alarming phenomenon in Bangladesh dangerous. 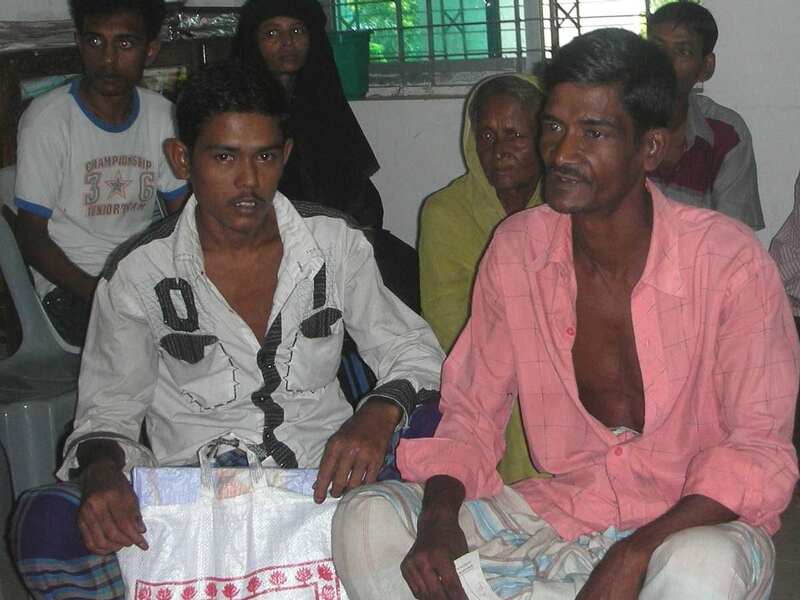 Of course, large number of drug addicts in Bangladesh is a serious national concern. This is the first stag of drug impacts. At first, a person starts to take drug without concerning his body. At the early stage he takes it just normally, and gets the ordinary happiness, which makes him feel better. Sometimes, he wants to touch heavenly excitement and dreams himself as a floating constituent in the sky. This is the first stage of drug impact. Amateurs are in this group. They take drug once or twice a week with their friends or seniors in their locality, who are already addicted. He collects it and processes it to take. Picketing etc. and they feel thrilled to do it. After the pre-mature stage abusers become seriously addicted. They have to take it every day, after a certain period. In maximum of cases it is taken from evening to night time. For that, they are busy all day long in collecting the expenditure of drug. They need much more money for it and sometimes they turn against the law. Many discontinue their education after failing to concentrate on any kind of discipline. After mature stage most of the abusers stay on the verge of decaying. It means gradually their lives crumble. Gradually after a few hours they have to take it, otherwise their body system stops. In that situation the abuser loses human characteristics and behaves like a monster. He lost control and balance of power over himself/herself. Abolition of thinking and also of memory/dementia. Tuberculosis, bronchitis pneumonia, asthma. Lung, cancer. Anemia, losses of immunity power. Above mentioned treatment methods are applied considering nature of drug materials wealth and nature of addicted man. Familial role: every family of addicted person has to believe that addiction is curable problem. It is possible to come back sound life through appropriate treatment and milieu; the guardian should not neglect and hate the addicted person. The guardian should give them appropriate milieu. Role of cure center: the addicted person should be given proper educational knowledge with treatment. The cure center should give them proper training. Under mention the steps can be accepted as preventive method. To control furtive, sale and uses of drug materials. The N.G.O’.s, BDR, Police and law enforcement department should be more effective. They should take more effective and realistic steps. We should be careful so that children cannot mix with bad boys. The usual law should be sterner and should be more applied against furtive sale and usage of drug materials. The curriculum of primary to university should be enrolled, remedy and resistance of addiction so that the students can acquire knowledge from it. We should manage meeting, seminar to create awareness to the people against addiction’s the radio and television should be necessary steps for it. Kamal Mia is an inhabitant of Beranagar village of Narsindhi district. In his occupational life he was a day labor. He was a construction labor and his daily income was around 200 Taka per day. He had a happy conjugal life with 1 son 2 daughters. He lived in the same house with his elder brothers though he was separated economically and had a separate cook; but he had a sound relation with his brothers and he also look after his mothers by his short earning capacity after maintaining his family. His children were school going. Economically he was not enough well off but he was not unhappy. He came in contact with drug 10 years before falling in curiosity and bad companion. Economic hardship and occasional family conflict also encouraged him to take drug earlier of his drug abused life. He was also little bit interested to test drug. He started with Cannabis Sativa which is locally known as Ganja, one kind of drug is produced from leaf of Cannabis tree. This is available in Bangladesh. He was accustomed to it for 2 to 3 years. Then he started to take Pathdine injection. It’s a serious drug which harms a human being physically and mentally. It contains serious unhygienic chemical. He took it 3 years. After that Kamal Mia started to take Heroin, popularly known as White Powder. Now he is addicted to several drugs from last 10 years. But these drugs have broken down his family, his conjugal life and happy familial life. He needs at 200 taka every day to manage drug specially. When he could earn, he managed this amount of money from his earning. But after a certain period he could not earn due to weak health and his defame towards work. He could not provide satisfactory labor and would not get the opportunity of work for his low performance. Thus he adopts the illegal way like stealing, gambling, hijacking etc to manage money for drug. Sometimes he creates pressure on his family especially on his mother to provide him money for purchasing drug. When Kamal Mia came to the hospital for treatment; the doctor after primary observation told me to take Kamal’s short history of addiction life. I took his history. But after hearing everything from Kamal’s mouth it revealed to me that he could be an effective case for me as he history is really critical and he has a family to maintain. Still he is young enough and he had occupational life. His wife, children and mother depend on him. So, they are vulnerable for the addiction Kamal. Thus if we can recover Kamal from drug addiction and rehabilitate him at least 4 person can be lived with safety and satisfactorily. Kamal’s recovery is very much important for that purpose. I decided to take Kamal as my case so that I can help him actively staying with his close contact. Kamal had completed primary education from his local school. In his school life he was not enough punctual and sincere. It happened for not getting proper guidance from his parents and school and also for economic hardship. His parents were completely illiterate and could not understand the significance of education. After completion of primary education; he felt disinterest towards education. Noticing this, his parents engaged him in work. Kamal’s physical condition is much worse at present as he is taking drug since the last 10 years. Now he is suffering from various physical and mental diseases like physical weakness, fever, malnutrition, gastric ulcer, urine infection, frustration, mental conflict and disturbance etc. Due to physical illness he could not earn money. He does not take part in every day’s common activities. He is drowsy and sleeps most of the time of day. He is broken health. He feels much difficulty to maintain normal interaction with his family and society members. When I took his interview, he informed me that he is mentally shocked, frustrated and digressed. He wants to return in normal life but he could not do it and this gives him much pain. Few months before his wife have left him with his children and this incident broken down him mentally. He could not maintain his family and also could not send his children school. As he is known as a drug addicted in his locality; he does not get any work. Here to mention that his physical condition not supportable of work. So mentally he is in much panic stage. Kamal was born in a very poor family. His father was a poor farmer and very rigid to religious sentiment. So there was not much scope for him to get recreational moment. After drug addiction, he is socially isolated and ostracized. Society members do not trust him and neglect him as an addicted. I have provided supportive and modifying treatment for the recovery of Kamal. a) I forbade him to not mix with the peer group with whom he took drug b) I suggested him to take regular physical exercise after release from the hospital c) I advised him to take a vocational training so that he can manage a job d) I suggested him to rebuild his family and send his children to school again a) I also told him to ensure reular attendance at weekly follow up meeting. I counseled his family members when they came with him during treatment. I told them not to give Kamal any opportunity to mix wit his bad peer group. I suggested them to take proper care of Kamal. I also advised them not to irritate Kamal. I told them to control money supply. I suggested them to bring him in regular follow up. After release Kamal is living in a slum with his relative. After 15 days of his release I went there and talked with him and his relative. They informed me that Kamal is obeying doctor’s advice. I request them to take proper care of him. I regularly followed up Kamal after release. Every Sunday he came to agency for follow up. But after few weeks he became irregular. I told him to be regular. I think our restless effort has encouraged Kamal a lot to response spontaneously during treatment. He was punctual in daily morning meeting and other activities. After release I found symptoms in him of improvement. Now his health condition is satisfactory enough. He is looking for a job. Amirul Islam is the youngest son of Mojammel Haque.. He is loved by the family member as a youngest son. He is quiet gentle and smart as well as modest. From the very beginning of his school life he is punctual in his study. He was popular to his teachers and friends for his academic performance. He obtained CGPA-A+ in S.S.C examination. After that he got admission at NotredemeCollege as a Higher Secondary student. He was gifted a cell Phone as a reward for this better result in S.S.C examination which helped him to make a peer group in college. Two or three friends of his peer group were drug addicted but he did not know it at earlier stage. One day in an occasion they offered him to test a drug; he took it curiously but he did not get any pleasure from it. But his friends informed him that if he takes it several times then the actual pleasure arise. So he again took drug and after few days he became dependent on it. Shobuz admitted himself at University of Dhaka. He involved with some organisation and tution.By doing these he earned money. So he has plenty of money to buy drug. His family did not know that he took drug. They suspected his after doing bad result at university. After a long observation they became confirmed that he is accompanied with bad friend and taking drug regularly. Shobuz is a student of the University of Dhaka. His father is a retired Govt. officer. He had a hand some amount of pension after retirement. His two elder brothers are doing high salaried job. Their family is standard, educated and economically well off. Babu’s manner and attitude was not good enough . He was little bit talkative. I talked with the staff and nurse of the hospital; they informed me that his is quiet gentle and modest and curious to continue his study. He is also very cooperative in treatment. He is shocked for his deed and he wants to be cured. He is obeying all the rules and regulation of the hospital and he keeps the ward neat and clean. His family and social background is well. He is a brilliant student having a bright future. I saw that I have plenty of opportunity to apply my social work knowledge and skill to recover him from addiction of drug. It reveled to me that I should take him a case because he has a lot to provide his family and society. I talked with my Supervisor Selina Rahaman and occupational therapist of the hospital.As i am a student of DU so hospital authority supervised me to work with the case. In campus, Shobuz close friends were drug addicted. When he mixed with them they encouraged him to test drug. He also had little bit curiosity about drug. When his friends offered him; he could not refuse. First he felt discomfort from drug but day by day he started to get comfort and he became dependant on it. As a novice social worker I tried to help shobuz from social work point of view. I discussed with the doctors and nurse about the physical condition of Shobuz and motivated them to proper action and extra care. To restore his mental fitness I talked with the psychiatric and occupation therapist to provide necessary counseling. After a long observation it revealed to me that Shobuz will be able to return his sound family and social life; because he took medicine regularly, came in follow up regularly and his family members are also doing everything for his recovery. Moreover he has great eagerness to be cured. I wish his beautiful life. I suggest him to take readmission for complete recovery and he accepted it. After release he is maintaining communication with me.I wis his bright future. Present address : BasundharaHousingCity, Dhaka. Permanent address : Dinazpur Sadar, Dinazpur. Liton was punctual in his study up to class-10. He was a good student and passed SSC examination getting CGPA-4 (Grade-A). But from the very beginning of his school life he could not adjust with the class mates; he went school with his family members or alone and kept himself far from the mainstream of the class students. He could not play with them; also could not share study with the classmates. As he would not talk with others, so the other boys of the class were not interested to him. All the time he remained dull and gloomy and would not maintain normal social interaction. So he had a faulty physical and social development. He behaved rough withhis family members, made conflict in family. After SSC exam he passed maximum moment outside home. Even sometimes he would not return home without informing. Day by day he became desperate. When his family members knew that he takes drug to get mental satisfaction they try to keep him far from drug by advice, love and affection. But their attempt went in vain. He could not tolerate his family members. When I took interview of Liton in follow up room, did not react with me normally. He disagreed to talk with me. His family members informed me detail about him. I took interview of liton when he came to hospital for admission. But during interview period he was very non-cooperative and could not maintain normal interaction. Even he behaved rough with his parents in front of us. After his admission I talked with Mr. Akhtaruzzaman Selim (Resident Psychiatric) of the hospital about the problem of Liton. He informed me that Liton is not only a drug addicted but also a psychiatric patient. His childhood and adolescence periodical growth was abnormal; because he did not mix with other boys of his class. His parents also did not act on appropriate role to moodily Liton. He thinks that what he talks and does is right others are wrong. His problem is chronic. He needs deep and long intensive care to come back in normal psycho-social life. He advised me to take Liton as my case; because I have as a novice social worker I have important role to play in the treatment of Liton. Liton’s father is a retired army officer. After his retirement he joined at Basundhara Garden City as a security officer with a salary of 30000 TK. Per month. He also has a handsome pension amount after retirement from army. He can maintain his family by his earning. There is no economic problem in his family. Now Mr. Bankim’s family is living in Dinajpur. But he and his son Liton live in Dhaka. Mr. Bankim keeps Liton far from his family members because his tortured and behave rough with them. Causes of Liton’s drug addiction are different than others; because his psycho-social abnormality has stimulated his to be addicted. He has a deviant psycho-social development. He thinks that he is doing everything right and he has no problem. When anybody tries to advise him he become annoyed and thinks it’s a dishonor to him. He gets mental shock and takes drug. He does not know the harmful effect of drug. He only knows that drug is his best friend and gives him pleasure. As a novice social worker I tried to help Liton from social work point of view. I discussed with the doctors and nurse about the physical condition of Liton and motivated them to proper action and extra care. To restore his mental fitness I talked with the psychiatric and occupation therapist to provide necessary counseling. I tried to build up rapport with Liton. First few days he was very non-cooperative but when he noticed that I am giving him huge importance, he tried to trust me. I went to liton’s house after his release. I talked with him and this time he behaved with me comparatively well than previous time. I also talked with his father Mr. Bankim Mondal. He informed me that he noticed symbol of improvement in Liton. He would not allow Liton outside home alone. Actually Liton’s problem is very difficult to solve in view of psycho-social perspective; because he is addicted as well as psychiatric patient. It needs long term intervention and concerted action to cure Liton. The matter is not easy. I tried my best to provide my best effort for Liton. I managed him to take readmission though he was reluctant to it but I motivated him. It revealed to me that his is looking good than previous time. If proper family and institutional are to be continued we can hope to see Liton as a sound and healthy man. I wish his bright future. Naeem Islam Khosru s a student of DhakaBanglaCollege. His father is a senior executive of a renowned private organization. He gets a high salary from his job. His mother is house wife. He is the eldest son of the family. Considering all aspects his family condition is quiet well. Simply i can say Naeem has a good mentality.Naeem manner and attitude was enough attractive. I talked with the staff and nurse of the hospital; they informed me that his is quiet gentle and modest and curious to continue his study. He is also very cooperative in treatment. He is shocked for his deed and he wants to be cured. He is obeying all the rules and regulation of the hospital and he keeps the ward neat and clean. His family and social background is well. He is a brilliant student having a bright future. I saw that I have plenty of opportunity to apply my social work knowledge and skill to recover him from addiction of drug. It reveled to me that I should take him a case because he has a lot to provide his family and society. I talked with my Supervisor Selina Rahaman and occupational therapist of the hospital to give him proper solution. In campus, Naeem close friends were drug addicted. When he mixed with them they encouraged him to test drug. He also had little bit curiosity about drug. When his friends offered him; he could not refuse. First he felt discomfort from drug but day by day he started to get comfort and he became dependant on it. As a novice social worker I tried to help Naeem from social work point of view. At the time of admission Naeem’s fathere requested me to take some extra care when he informed that I am working with the patient. As he is young and has a long future I think take him as my case so that I could play much role for his recovery. I discussed with the doctors and nurse about the physical condition of Naeem and motivated them to proper action and extra care. To restore his mental fitness I talked with the psychiatric and occupation therapist to provide necessary counseling. After a long observation it revealed to me that Naeem will be able to return his sound family and social life; because he took medicine regularly, came in follow up regularly and his family members are also doing everything for his recovery. Moreover he has great eagerness to be cured. I expect his general and drug free life. Abdul Kader Babu is a painter. His monthly income is around 8000 TK. His father is a business man and earns 10000 TK. salaries per month. His three brothers also earn.After all they are socially and economically established. His family has fame and social dignity. But his addiction has stolen the happiness of the family. Abdul Kader Babu is very much talented. His painting hand indicates a outstanding painter criteria. I talked with the staff and nurse of the hospital; they informed me that his is quiet gentle and modest and curious to continue his study. He is also very cooperative in treatment. He is shocked for his deed and he wants to be cured. He is obeying all the rules and regulation of the hospital and he keeps the ward neat and clean. His family and social background is well. He is a brilliant student having a bright future. I saw that I have plenty of opportunity to apply my social work knowledge and skill to recover him from addiction of drug. It reveled to me that I should take him a case because he has a lot to provide his family and society. I talked with my Supervisor Selina Rahaman and occupational therapist of the hospital. They co-operative with me to work with the case. From the boyhood his behavior was just like an extrovert oneday he showed curiosity about drug. When his friends offered him; he could not refuse. First he felt discomfort from drug but day by day he started to get comfort and he became dependant on it. As a novice social worker I dedicated to help Babu from social work point of view. For proper solution of drug addiction supportive treatment is effective. I discussed with the doctors and nurse about the physical condition of Babu and motivated them to proper action and extra care. To restore his mental fitness I talked with the psychiatric and occupation therapist to provide necessary counseling. In keeping sufficient time with observation and proper care it revealed to me that Babu will be able to return his sound family and social life; because he took medicine regularly, came in follow up regularly and his family members are also doing everything for his recovery. Moreover he has great eagerness to be cured. I wish his beautiful life. My conception is that i could able to provide service for him to lead a drug free life. Present address : 5, Natun Bazar Road, Badda; Dhaka. Permanent address : 5, Natun Bazar Road, Badda; Dhaka. Binay Kumer Pall was hard working man before drug addiction but now is passing his life without having a job. He worked in a factory as a security guard. But when the authority informed that he is a drug addicted; he lost his job. He is the only son of his parents. He got much money, love and affection from the family. From the very beginning of school life he was very careless towards his study. But his parents were not so much attentive about the education of their child.Binay had a peer group in his locality and most of the members of his peer group were drug addicted. Day by day he became addicted. His parents thought that after marriage their son would come back in normal life. But their prediction proved wrong. His condition remained unchanged. He could to leave drug. Now his family members are in deep strain and tension as Binay is a addicted and unemployed. There is prevailing a callous and confliction environment in his family. His father is businessman. From this business he earns around 1500 TK. Monthly through which he maintains family very simply. Binay collects money from his family by creating pressure and misbehave. His parents become compel to provide him money when he creates massive callous by not getting drug. I Observed a frustrating look when he came in hospital with his family members for his admission. They informed me everything when they knew that we work with the patients. They requested me to take some extra care for him, because future of all the members of his family depending on his recovery. He is also very cooperative in treatment. He is shocked for his deed and he wants to be cured. He is obeying all the rules and regulation of the hospital and he keeps the ward neat and clean. At the initial stage Binay showed a interest drug and just for one time took drug.That was the turning point to be introduced as drug addict.Also he thought that drug taking is a fashion and it provides great pleasure and these are not so much detrimental for health. When his friends offered him; he could not refuse. First he felt discomfort from drug but day by day he started to get comfort and he became dependant on it. As a novice social worker I tried to help Mahedi from social work point of view. I discussed with the doctors and nurse about the physical condition of Mahedi and motivated them to proper action and extra care. To restore his mental fitness I talked with the psychiatric and occupation therapist to provide necessary counseling. After providing counseling follow up intervention and for long time observation it revealed to me that Binay will be able to return his sound family and social life; because he took medicine regularly, came in follow up regularly and his family members are also doing everything for his recovery. After two follow up I talked with the doctors for his readmission to ensure his complete recovery. It proved very effective.First noticed that my efforts have been worked well.Moreover he has great eagerness to be cured. I wish his beautiful life. For the betterment of the patient we have a opportunity to home visit and inter-agency visti. There is another opportunity is to lead a research. Most often a social worker can arrange work shop, seminar, symposium etc. to creat awareness in the patients. Afterall we can say, in field work practice a social worker can play a good role to ensure proper service and the opportunities which are given from the agency by funding of government. I used to take part in sitting with my institute supervisor. There I have to discribe all of my activities infront of my institute supervisor. I have prepared a research on “ The socio-economic condition of coming patient of the agency”. In this research I tried to find out the real picture of the socio-economic condition of the drug addicts. I have taken several interview from the student of DhakaUniversity. Through taking this interview I learned how to take a interview. I have studied 12 cases during my field work in the agency. All of them are the patient of the hospital. I have tried to use my social work knowledge, skill, experiences to solve the clients problem. I have visited 4 agencies similar to the activities of Central drug adiction treatment centre. These agencies are BIRDEM, DMCH, Shorkari Shishu shadon, Probin Hitoishi Shongho. I collected donation from different sources for the social service department of the agency. This money is spent for the benefit of patient of the hospital. It is mentionable that I have donated 1000tk for the Rogi Kollan Shomiti. In several time I have purchased medicine for the patient of the hospital who were the benefitiary of the social service department. In my field work I have communicated with the doctors. Specially with the doctors who were very cordial to the patient and the field work practice. Although the main purpose of the communication is to ensure proper treatment and sevices for the vulnerable patient. During my field work I have done different official activities in the office of social service department of the agency. I have prepared the list of monthly and anually income and expenditure of the office and prepare the list of the benefitiaries etc. To work with the clients is very important for me as well as the clients. I tried to accept the clients assuring them my capacity so that they could accept me as a social worker. I was careful to buildup succesful rapport with the clients. Through the effective interaction, body language I tried to make them understand that I could help them. To collect different information about the clients and their problems I have used interview technique. I interviewed the clients, the parents, the relatives, doctors and nurses. I found several information through this technique, to understand the overall condition of the drug addict. Based on the information I have found through interview, I got a clear concept about the clients problem. And it was helpful to find out the actual problemof the client had. 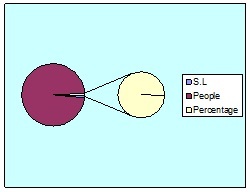 In diagnosis I have used dynamic and etiological diagnosis techniques. I have used psycho-social treatment techniques to enable the clients to cope with their problems. Some times I have used own prudence to solve their problems. After solving the problem I ask cordialy in following up the clients. As a social worker I could not let them to turn into the previous situation again. For the effective and sustainable solution of the clients problem I have communicated with the clients, doctors, nurses. And to help the clients with financial assistance and medicine etc. I tried to communicate with the social service officer. As my clients were the drug addicted person, I used to show them my highest sympathy and empathy to them. And I tried my best to make them understand that I also feel their problem as they feel. In my field work practice I have used a quite different and modern format of process recording provided by my institute supervisor. I tried to abide by his all of the reactions. Besides the avoc methods skill and techniques I have used, other techniques and methods. When I have done official duties in the agency prepared research report etc. To prepare the research I have used sampling technique and two different questionnaires. Now this time social work has been regarded as a renowned discipline becouse of its field work perspective and other precious social services. Every probationary social worker get chance to apply his acquired knowledge by taking help from field work practice. If they apply their knowledge in practice field they will able to gain demandfull experieces from the field work. Modern many national and international organizations give preferece on practice field orriented knowledge. During my field work in the Central drug addiction treatment center I have gathered a vast experience. Though I have stayed there only sixty days, I tried to watch the functions of the Central drug addiction treatment center with the eyes of a social worker. I was closely related with the activities of the agency. During my field work I have conducted a small survey on “patient’s knowledge about the activity of the Central drug addiction treatment center . I asked 100 people randomly if they know that there is a department to help the drug addicted peoples. Only 20 people answered affirmatively and rest of them does not know about the existence of this department. A pie chart will clarify it. At the very beginning I was little bit confused about my role. Working with the clients was interesting also, because I could dive into the deep of their problems interactions with the clients gave me vast experience. Going through the whole problem solving process and interaction I have found different attitudes, beliefs, thoughts, emotions, hazard and etc of the clients. These made me to more insightful and careful in dealing further case. During field practice period I got the opportunity to mix with the different types of drug abusers and their family members which was a real chance for me to know the actual context of why people are taking drugs in spite of knowing the negative aspects of drugs. I have been able to understand the difference between fact and reality. I observed behavior, attitude, need, expectation and feelings of the drug abusers which helped me to fulfill my theoretical knowledge. After completing my field practice period I have got a complete idea of drug addiction treatment. I have been recognized with different kinds of drugs which are available I Bangladesh. I have also learned the negative impact of drugs and channels and ways of drug supplying. I applied my theoretical knowledge going to conduct case study, rapport build up, follow up, home visit, counseling and other official works. I have also learned how an administration should run. Here I have enriched my social administration knowledge. I have learned to arranged meeting, seminar and awareness and cultural programs. I have learned to build up professional relationship `Rapport’ with the client. I have learned to apply professional knowledge, skills, norms and value system of social work going to work with the client. I have known the multi-various causes of drug addiction. It helped me to make an analytical mentality to find out the reasons of drug addiction. The social service department of central drug addiction treatment centar has a lot of strength side. It works under the ministry of social welfare through an association called patient welfare association. It has a strong governing body. From here patient get help from the social service department. Students from different universities and colleges work here as apprentice social worker. The Social service department has some limitations. It helps only the admitted patients but outdoor patients can not get proper help though they are poor too. The fund of Rogi kollan shomitee is not rich. So it can hardly continue its function. Due to lack of man power it can not work properly, besides it has scarcity of the office room. The social service department of Central drug addiction treatment centre has a plan to creat a digital social service centar for the patient with the help of the apprentice social worker coming from different universities and colleges. It will be a great opportunities for the agency to spread its activities and programes. Some times the official of the hospital found un cooperative with the social service department. Some administrative complexity makes the apprentice social worker disappointed. Some times nurse, doctors and metrons behave rudely with the social worker just for nothing. And that is why social worker do not want to visit the ward and communicate with the patients regularly. First few days the agency authority was not cordial and cooperative enough to work with them effectively; but when our agency supervisor introduced us with them formally, they accepted us and helped us to work with them effectively. The agency has extreme lack of treatment instruments which is a great hinder for smooth service delivery. I noticed that there exists a massive disparity in supplying of opportunities between the paying and non-paying patients. All the patients are staying in the same floor. When they see that they are deprived in getting food, medicine and other benefits; they do not want to cooperate in treatment. 14 days treatment is quiet inadequate for complete recovery from the addiction of drugs. It needs at least one month. As a result of half treatment the released patients slip again and again and ultimately the treatment proved a failure attempt but thee are exception also. For the less addicted 14 days is enough. In some cases some staffs behavior is very ruff and rude towards patients. Psychologically the patients could not accept it. There is no specific budget for the novice social worker. So for the lack of finance social worker can not work with the patients. They only conduct psycho-social counseling. Hospital’s ambulance service is not in operation from long time. It has no driver and logistics. The doctors, nurse and other staffs do not have any skill development training program. Even they are well known about the social workers role in treatment process. Some staffs also think social worker’s role is needless for the recovery of drug abusers. There is no separate room for the novice social workers. Lack of coordination and cooperation between the hospital authority and social service department is also mentionable. The most mentionable matter about the agency is it has no rehabilitation center. In frug addiction treatment after care and rehabilitation are the prime indicators for the complete recovery from addiction. Lab, pathology and other equipment are not modern. It has no emergency unit and own blood bank. Indoor and out door recreational program is very limited. After the details and indepth discurssion about the Central drug adiction treatment centar, we come to a dicission that, this agency is facing mighty problem like lack of accountability, transparency and financial constant. The duration of staying in the hospital for the patients should be increased. To increase the standard of food for the patients of non-paying ward. The standard of food of paying ward should also be increased as they pay a handsome amount of money. To inaugurate the constructed rehabilitation center for the released patients immediately for effective treatment. To ménage an interview room and counseling room for the apprentice social worker. To increase co-ordination and integration between the functions of hospital and social service department. To take some new programs by social service department; such as- motivation and rewarding, group counseling, family counseling, medical allowance etc. Awareness program on drug abuses should also be increased. To increase to budget of social service department. Outsourcing and in sourcing attempt should follow to increase the budget of this department. To ensure active involvement of the apprentice social worker with the entire treatment process so that they could contribute more for the effective treatment patients. To take some income generating programs for the released patients so that they could earn some money which will safe them from economic hardship. To increase indoor games and recreational facilities for the patients under treatment. Released patients are very much irregular in weekly follow up though it is an integral part of complete recovery. So the agency should set up a communication system with the released patients so that they come to take follow up service. Group therapy program should be increased to ensure the attendance of the patients in therapeutic activities. Bureaucratic formalities should also reduce to get quick treatment and admission. Apprentice social worker should give full consent to work with the patients in their ward which is now is strictly restricted. The agency should increase its budget for home visit and after care treatment. To conduct some research and investigative works to find out more effective way for the treatment of the drug abusers. Free dispensable medicine program should increase. To purchase new modern equipment for the pathology of the agency. To take staff development program for the better efficiency of the staff. There is no longer any doubt that social work satisfies the criteria for a profession. Social workers have to study the scientific principles of human behavior and the structure and organization of social institutions. They have to develop, on their own, knowledge and skill in woriking with people under specific social, economic, and emotional conditions. Today the proportion of trained social workers is increasing. there is a growing awareness on the part of social agency boards and public welfare commissions, as well as among the public, that professionally trained social workers are needed for the responsible, competent performance of social services. Successful application of theoretical knowledge highly depends on field work practice. It is mentionable that as the some time theoretical knowledge define the knowledge as seed and the field work practice is the free plantation and take care of it. It is also ralistic in social work education. Theoritical knowledge of social work becomes fruitful when this wisdom is implemented in practical situationto cope the problems through the field work students of social work able to understand how to apply their knowledge appropriately. Durring my field work I have worked with the social service officer doctor,nurses and with some cases. I have gathered a lot of valuable and precious experiences and knowledge from them. In some cases I have achieved success and in some cases I have failed to achieved it due to some problems related my limitation and the fault of the agency. I appologise for my unintentional mistakes and limitation. although my little works(report) may helpful for and essential to others for any jobs then my labour and efforts will be prolific. Again I can not preserve my emotion to say that field work in developed, developing and LDC plays a vital role in expanding and enviching the theoritical knowledge of field worker standing on the bookish knowledge. I tried with my best effort to do my duties and take my responsibilities properly. Finally I pray and bless that the social service department, CDATC may be live long and all activities would be more effective and progress and development oriented for the drug addicted persons to run a general and joyful life on the basis of these inprovement social work must get the professional recognition in the up coming future. Its my charished dream.